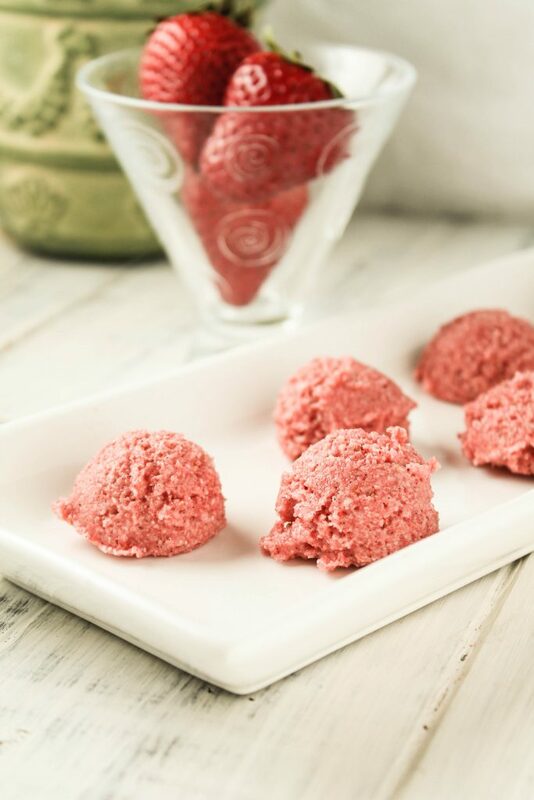 A no bake recipe with lovely pink hue, these strawberry macaroons make for a fun recipe! Sweet and tart, loaded with healthy ingredients, these would be perfect for a healthy Easter treat! Sweet tart Paleo strawberry macaroons are raw, nut free, vegan, and easily keto too!! Many months ago, I was given the opportunity to sample two of Hail Merry’s newest additions to the family. One of the flavors was strawberry and it really knocked my socks off. Problem is, I have yet to see them in our stores!! Like any self respecting food blogger…I set about making my own version. Since I already created the chocolate macaroon version, I knew this would be an easy adaptation. What I did different this time was NOT using all the ingredients included in Hail Merry’s. Theirs included almond flour and almond butter…both of which are not OK for my son. It was an experiment, and it worked…..REALLY WELL! With healthy fats and minimal sweeteners, these are a treat you can feel good about. A magical sweet/tart flavor combo that will have your taste buds singing! And lets not miss that these take under 10 minutes to make….a perfect treat for a busy person! I see these being a great addition to the end of an Easter feast! With their sweet pink hue, they will brighten any spring time festivity! 3 tablespoons maple syrup honey, orcoconut nectar, to taste. For a keto verion, use something like Surkin or Lankanto Syrup. Place all ingredients into the bowl of a food processor. I used my 14 cup Cuisinart that I LOVE. Drop the batter, about 2-3 teaspoons worth onto a lined cookie sheet. I used my small cookie scoop. That sweet tart combo is the magic for sure!!! So cute! And so easy to make. YUM!! YUM! They look so flavorful and delicious ! Totally love it ! Adorbs and look so delicious! tina recently posted…40+ Keto Low Carb Instant Pot Recipes! I couldn’t quite believe it when I saw these! Paleo Macaroons! They look beautiful – I’ll be definitely making these, maybe for my daughter’s birthday coming up. Thanks! These look so good and I love how quick they are! What a fun, easy treat! This is super fun! My mouth is watering thinking of those freeze dried strawberries! And they give such a great color! What a delicious looking fruity snack. These are so cute and I love the color! I love macaroons, and these are so perfect for celebrating the warmer weather. Too much water Fay, sorry!! They would not blend with the oils and it would be watery! These are so pretty! Thanks for sharing it with us at Savoring Saturdays last week. Each of your healthy desserts just gets better and better. 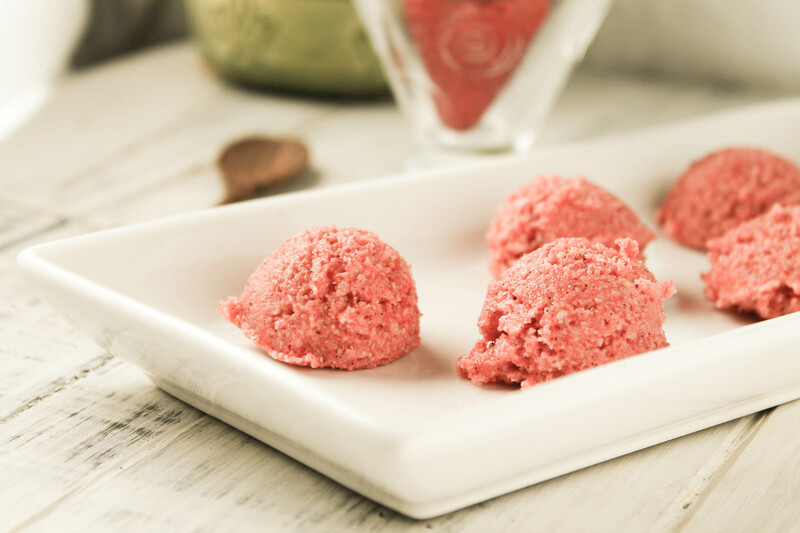 These Raw Paleo Strawberry Macaroons look so delectable. I’m pinning and sharing! These look beautiful, Tessa, and I love that they are no bake! What a delicious treat. Pinning and sharing. Thank you for being a part of the Hearth and Soul hop. I printed this recipe out. Sounds like a wonderful healthy snack. Thanks for sharing on Real Food Fridays. Pinned & twitted. These look like a delicious treat! What a great combination! I need to get some freeze dried berries and try these!! will it be okay to use fresh strawberries? Too much water Meera, sorry! FInd a way to lose some of the water and it might work, but the flavor will not be as concentrated. I know this comment is old, but in case anyone else comes across this and is wondering…. I didn’t have freeze-dried strawberries, so I tried first with dried strawberries. Definitely didn’t work – they wouldn’t blend. Then I tried fresh strawberries (2 large ones) by decreasing the liquid and adding psyllium husk. While the batter was pink, it was still too watery and hardly had strawberry flavor. Only do this recipe with freeze-dried! Tessa, these look perfect for the AIP Recipe Roundtable, if you care to share. They look gorgeous AND delicious. I found the recipe on Real Food Forager’s list of 2013 favorites. I hope you had a great holiday, and 2014 is the best yet. You and my son both! Hope they. Bring a smile to your face! These look divine! Thanks so much for sharing your post on Wildcrafting Wednesday! I hope to see you again today! Just made them! Oh wow! They are awesome! Thank you so much. This recipe is definitely a keeper! Yum! glad you love them too Joyce! These look so neat, and btw your chocolate hail mary knock-offs are totally my go to quick dessert and my in-laws love when I make them! Thanks so much for sharing this on Waste Not Want Not Wednesday, I’ve pinned it. These look so delicious and such a great spring/summer treat. Thanks for sharing on Tuesday Greens! Hi Tessa! So happy to have followed you over from Sunday Snippets. These macaroons take my macaroons to a whole new level with the inclusion of strawberries! Yum! Will definitely check out your other recipes! What a unique idea. I recently made some dehydrated strawberry rolls, I wonder if they would work..
hmm..i would be worth a shot Sherri…but freeze-dried are unique in that they quickly powder up…not sure dehydrated strawberries would pulverize to make this work…bu I would still try it!!! I love Hail Merry macaroons! They are my one weakness when I go shopping but they can be pricey. Looking forward to trying this recipe. Thank you! I love the color of these macaroons! (It’s almost exactly one of my wedding colors… hmmm, I may just have to make these!) 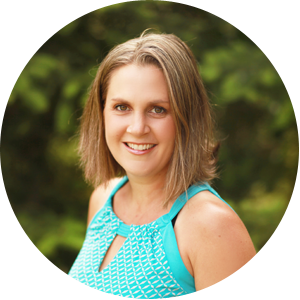 Thank you for linking up to the Spring Fling and sharing! Thank you for what looks like a lovely recipe. I have a question: Should I melt the coconut oil, or not? Hi Justy…I did not soften mine..the few minutes in the processor whipped that coconut oil into submission (aka, the heat from processing melts it up nicely! No big deal to use melted if you prefer…it will take longer to solidify is all! ooo interesting :o) thanks for linking up to Tasteful Tuesdays at Nap-Time Creations… Winners for the giveaway will be announced Wed… Have you entered?